It’s a summer pizza kind of Thursday! YES. Do you guys ever have weeks where all you really want to make is pizza? I feel like I’ve been making at least a pizza a week since June, and I cannot lie, it’s been amazing. I have done so many yummy combos, but today’s Peach Burrata Pizza with Honey Balsamic has got to be one of my favorites of the summer. I mean, peaches + burrata + honey balsamic?!? Yes, please! So you guys! Serious talk. I think that I need to go to Italy, and while there, I need to eat all the pizza, pasta and burrata I can get my hands on because I’ve been obsessed with them lately! Like I cannot get enough, it’s all I want to cook, eat and photograph. Have you noticed? Plus, this time next week I will hopefully be winding down from a big week of video shoots. I should also be off cookbook duty, at least for a little while (turning first draft of manuscript in on Sunday!). This means I can maybe, just maybe, have a day to like chill the heck out. What do you think? On my chill day should I plan a trip to Italy? Yeah, I’m thinking that’s a little ambitious for me right now. I should probably just get a head start on planning Asher’s Birthday trip to the Wizarding World of Harry Potter, but Italy soonish! Maybe I can get my Nonnie to go with me next summer or something. Who knows, but until then I’ll just keep making pizzas with all the burrata I can find. OH, but I gotta know, any of you guys that have traveled to Italy, where should I go? What should I EAT? Please tell me, I am so curious!! OK, but let’s chat about this here pizza. It’s kind of perfection in my eyes, seeing as it literally has all of my very favorites. I’m talking, basil, peaches, blue cheese, burrata cheese, salami and balsamic. Yum and YUM! Here’s what you need to know about this pizza. …it is super easy and fast to make. Pizza dinner in under thirty minutes. Score! …while I love blue cheese, and think it pairs so incredibly well with peaches, I do fully understand that not everyone is into it. If this is the case for you, you can use goat cheese, or just add a little extra burrata to your pizza. …for my meat, I went with salami. I adore it paired with the peaches and burrata. 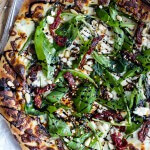 You could also use prosciutto or simply omit the meat to make the pizza vegetarian. As you can see, it’s a very easy pizza to adapt…but I gotta say, I love this pizza just the way I am telling you to make it. Be a little adventurous, give blue cheese another try, load on the yummy salami, and then even more burrata, and let’s all eat pizza!! I mean, OK if you insist. PS. Thanks to everyone for all of your kind comments on Tuesday’s post! If you have yet to check out Tuesday’s post, please do it now! There’s a giveaway happening, and um…breakfast popsicles! For real. 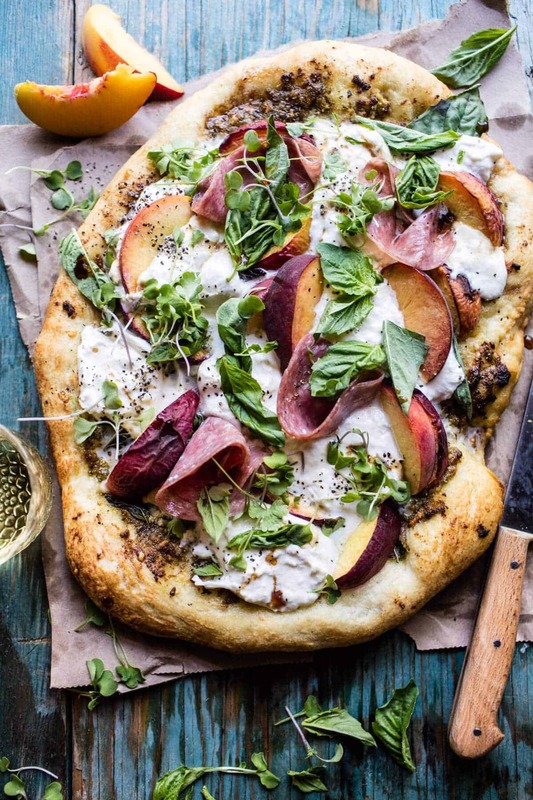 Peach and Burrata Pizza with Honey Balsamic. Preheat the oven to 450 degrees F. Grease a large baking sheet with olive oil. On a lightly floured surface, push/roll the dough out until until it is pretty thin (about a 10-12 inch circle). Transfer the dough to the prepared baking sheet. Spread the dough with pesto and top with blue cheese. Add the sliced peaches and about half of the basil. Drizzle the pizza lightly with olive oil, salt and pepper. Place in the oven and bake for 10-15 minutes or until the crust is golden, the cheese has melted and the peaches have caramelized. Remove from the oven and top with salami and burrata. Allow the burrata to sit on the pizza and warm through, about 5 minutes. Sprinkle on the remaining basil, and drizzle the pizza with the honey balsamic (see below). if desired add a handful of microgreens. Slice and eat! Combine all ingredients together in a bowl and whisk until smooth. Serve, drizzled over the pizza. Pizza Thursday for the win! ? Toasted Walnut Pesto and Caramelized Nectarine Pizza w/Spicy Balsamic Drizzle. 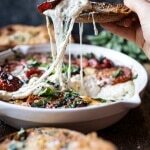 Margherita Pizza Dip (with Burrata). 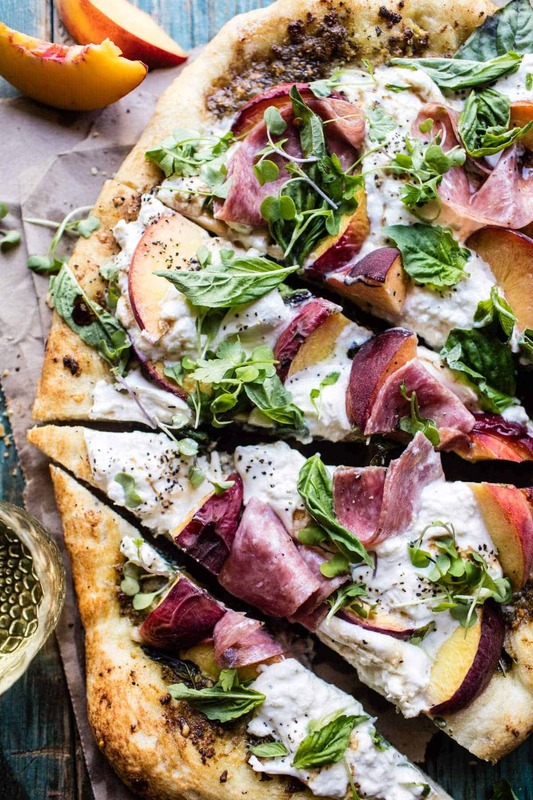 I love stone fruit on pizza with cheese – my husband doesn’t, however. Just replace HIS pizza with Heriloom tomatoes instead – that’s what I will do. Sounds perfect! Hope you guys love it! Thanks Toni! Yes!!! 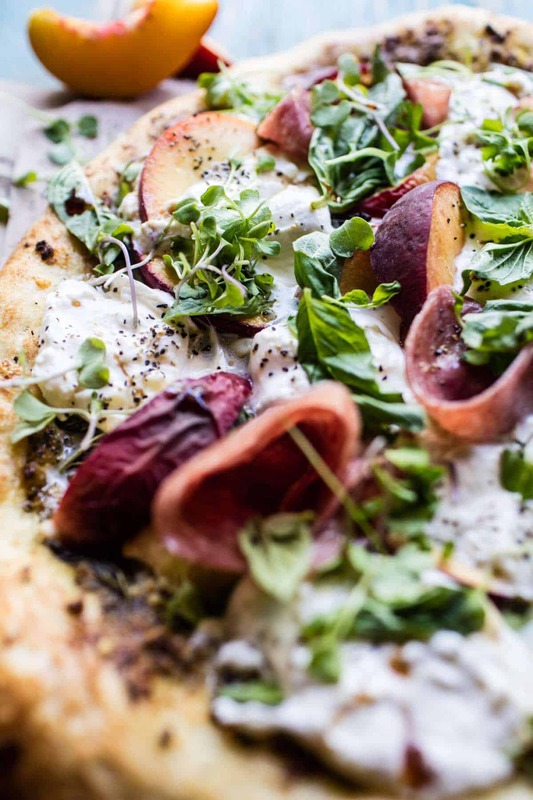 Peaches and pizza are such an unassuming, and yet completely BRILLIANT, combo! I feel like I could eat this entire thing, ah, and all that burrata!!! I thought it was weird at first! haha So good though!! Thanks a ton Tori! This looks so good and the crust looks even better. What a beautiful pizza! If pizzas can be called beautiful lol. Haha!! Thank you so much Stephanie! I loove pizza and make it quite often but not sure about the peaches there, however, looking at your pictures I guess I would eat anything! As for the trip to Italy, I’ve been to a few places but I think wherever you go you will love it! Never been to Tuscany but every time I see pictures I just wanna go! But the Emilia Romagna region is a must – it is home of prosciutto, parmesan cheese and balsamic vinegar! They say there is the best food also! Been to Bologna (the capital of this region) and the pasta dishes were amazing! I hope you like it!! For sure A bit weird, but I promise its good! I think that I will love it no matter what as well! Sounds like theres a few places I need to make it to!! I love your constant combinations of fruit and savory! I especially love burratta!!! 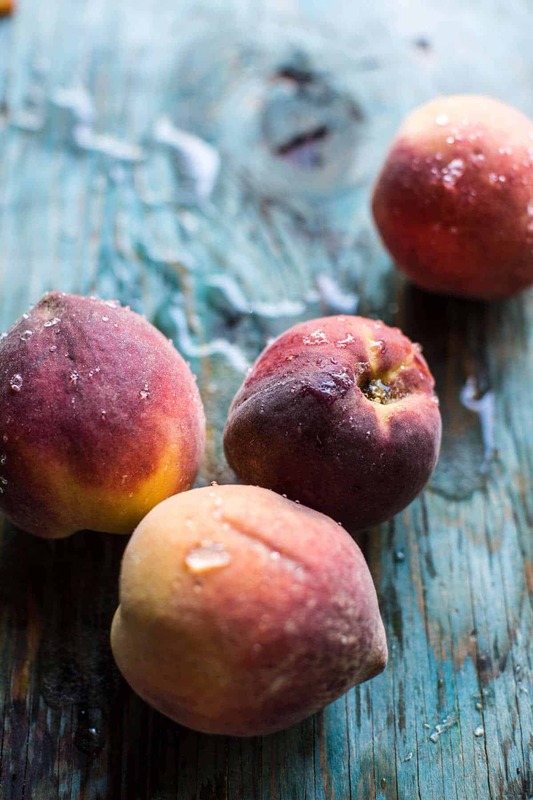 I bought a box of peaches on Saturday and they are ready to eat so now I have the first recipe to make with them. Perfect!! I hope you love it Nancy!! Anyway, I don’t think you could go wrong! 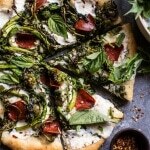 By the way, I also definitely don’t mind all the pizza and burrata goodness on your blog lately – I mean, you can never have too much pizza and burrata, right? Hey Melanie!! Oh my gosh!! I totally need to go to Italy!! Thank you so much for all these great suggestions, I am so excited!! I mean ice cream in Rome and pizza in Naples!?!? yES!!!! ?? happy Friday!! Oh believe me I burn mine too! Takes A few times sometimes!! Thank you Phyllis! 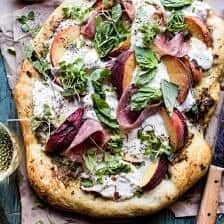 One of my favourite Summer salads contains peach and burrata so this pizza sounds like heaven to me! Can’t wait to make it! YAY Hope you love it Vicky! OH MY GOSH! Those all sound so freaking good! I need it all! Sounds like I must go! Nothing like grilled peaches in the summer. I enjoy making summer salads on Naan Flatbread right on the grill drizzled with some balsamic. Your version looks quite tasty. Ah so good on flatbreads! Hope you love this Vicki! Thank you! I don’t usually like fruit on my pizza either, but I’m going to give it a try. I think the savory and the sweet from the peach might be a fun change. Your photography is stunning and makes everything look delicious! Awesome! I hope you love it! Thank you so much! OMG This looks amazing! (And easily vegetarian!) I’ve been love love loving peaches + almond butter on toast lately. 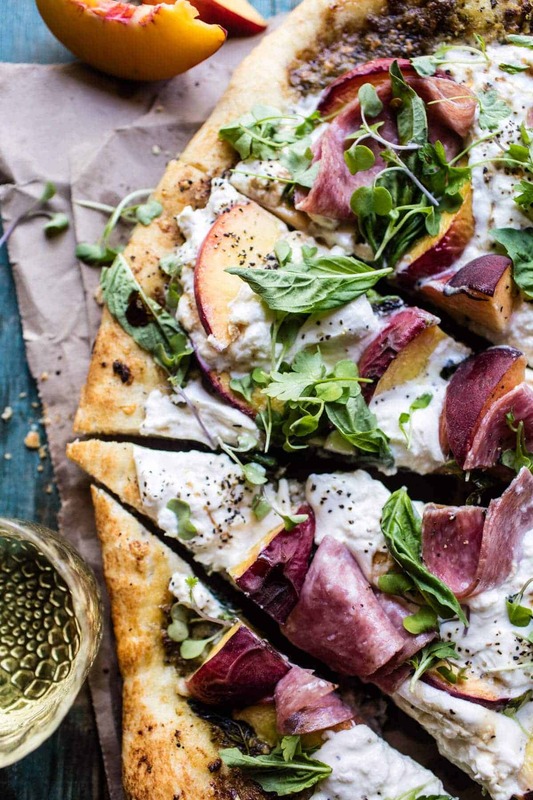 I love the idea of peaches on pizza! Very easily vegetarian! Thanks so much! I hope you love it Liz! 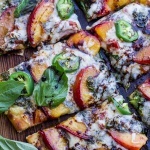 During the summer I want to add stone fruit to EVERYTHING, so I totally love this pizza. Must make this weekend – thanks for the inspiration Tieghan! Thanks so much Rebecca! Hope you love it! This looks amazing – so many of my favourite thing on one handy pizza! Italy is fantastic too, you should definitely try to plan a trip there! Thanks Maria!! It looks amazing!! 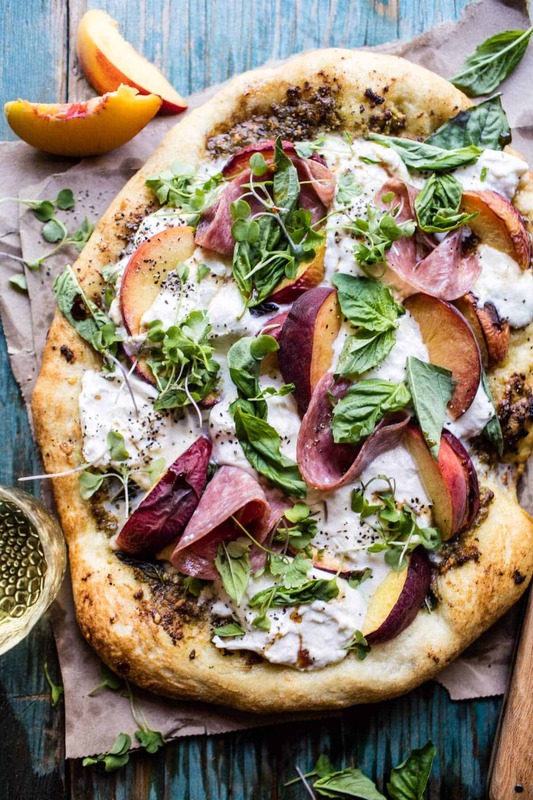 So gorgeous, I love a peach pizza in the summer! I can’t wait to make this! Grilled peaches are the best alone or on anything. A local pizza place makes a Pear, Gorgonzola, honey pizza (dessert) which is heavenly so fruit on a pizza is a nice treat. I just came back from Italy and I can’t wait to return next year–the people, art, architecture, food and ambience is amazing (as well as the limoncello and melloncello). WOW! First of all, so jealous you were in Italy! Looks amazing! That pizza sounds so good!! I enjoy seeing all of your exciting pizza combinations. My wife and I enjoy making pizza and espresso for our friends. Lately I have been sticking to no knead overnight dough. Do you usually make the dough yourself? Thanks. Hey Rick! Thank you! I do typically make the dough myself. I use a very simple recipe. You can find it here : https://www.halfbakedharvest.com/apple-and-caramelized-onion-pizza-with-pumpkin-seed-pangrattato/ thanks! Yum yum and more yum! The flavors were intense but wonderful together. Even my 2 year old gobbled it up! So simple but was very impressive. Made this easily after work with such little effort. Thanks for sharing! Oh my gosh!! I totally need to go to Italy!! Thank you so much for all these great suggestions, I am so excited!! I mean ice cream in Rome and pizza in Naples! Haha, yes! Your welcome! I really hope you love everything! Good web site you have here.. It’s hard to find high-quality writing like yours these days. I honestly appreciate people like you! Take care!! I am thrilled you love my blog Madden & I hope you continue to enjoy! Thank you! This was AMAZING!!!! I wasn’t sure about the salami and red pepper but everything went really well together. Great recipe! I will definitely make this again! Update: made this twice in one week because I love it so much!!! And printed it out to add to my “cookbook” binder of recipes I’ve made and love. I’ll definitely be following your blog. Super impressed! I found out this morning that my little town in the BC interior just had an Italian chef move in and open a cheese shop. I may have cried a few tears this morning when I found out that he is making burrata and I FINALLY HAVE A SOURCE FOR IT, right on my drive home from work, and can now make ALL of your burrata recipes. Excuse me while I take a moment to compose myself, haha! Ah I am so excited for you!! I hope you love all of these recipes Kate! Please let me know how they turn out! Hey lady! I made this recipe last year for the first time and it’s one of my summer favorites now. I’ve been looking forward to peach season just to make this. One of my favorite things about your recipes is how you always use fresh, seasonal ingredients. Walking to the farmer’s market on Saturday mornings with my cat in her stroller is one of my favorite decompression and self care activities. I make my grocery list for the week based on your recipes and get as much as I can from the farmer’s market. I tagged you on insta. Which I already know you saw, because you liked my post 🙂 I know it probably gets tedious going through everyone’s posts and tags. But I really appreciate that you take the time to actually look and like or comment. Now, for a question. My pictures NEVER EVER resemble yours. Haha. Especially!!!!! the pizza recipes. What’s the secret to having it not look like a gooey mess of indistinguishable ingredients? Thank you Tieghan! I am so glad you are enjoying the in season produce.. going to farmers markets is one of my favorite things to do! I am sure yours look amazing, I just take the photos under natural sunlight! I cant wait to go check out your photo on instagram! I am so glad you loved this Manuel! Thank you so much!